Smart buyers from all over B.C. 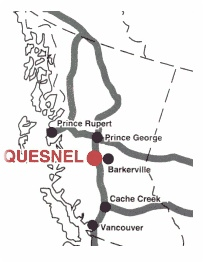 are coming to Quesnel to save money on their cars and trucks. Why? Because of the "Trucks are Less" sales campaign. 'How can we sell for less?' - Its easy. We operate lean & mean from a compact, neat, tidy facility strategicly located on Highway 97 in the heart of British Columbia. We stock only the most popular models with the options you want & need. Nothing more, nothing less. For those customers who want something out of the ordinary, we'll find it fast in Ford Motor Pool inventory, or we'll special order direct from the factory. 'Its really that simple.' Due to our low overhead, aggressive no-nonsense pricing policies, and down-home, friendly sales approach, we can sell for less. Best of all, we do it without sacrificing your sales or service satisfaction. In fact we have attained gold level certification in Ford Motor Company's Blue Oval program in recognition of our outstanding service. The next time you need a car or truck, contact one of the Deal Makers at Cariboo Ford, and save money!